Drakshasava is an ayurvedic tonic as well as a medicine. As a tonic, it is used for strength, debility after fever or chronic disease and general fatigue. As a medicine, it treats piles, gas, irritable bowel syndrome, headache, anemia, jaundice, cough, breathing troubles with feeling of restlessness, etc. Prepared decoction using Draksha and water and reduce the liquid to 1/4th i.e. 10.24 liters. Let it cool down and then mix Misri and honey. Add coarse powder of following herbs. Now, take fermentation vessel and add all ingredients and decoction in it. Leave the liquid with Draksha and herbs for a month for natural fermentation process. After a month, separate the liquid content (Drakshasava), filter it and preserved in glass bottles. Drakshasava mainly acts on VATA and PITTA DOSHA. It helps to cure all kinds of digestive problems like constipation, loss of appetite, gas, flatulence, bloating etc. It is also effective headache, fever, anemia, mild jaundice, chronic fatigue syndrome (CFS), cough, breathing difficulties and restlessness. It mainly works on symptoms like debility or physical weakness and restlessness. In ayurveda, the main two medicines are recommended for debility and fatigue – Drakshasava and Ashwagandha preparation (or Ashwagandharishta). Ashwagandha preparations are more suitable for people with VATA body type or VATA Dosha aggravation. Drakshasava is more suitable for people with PITTA body type or PITTA aggravation. However, it increases secretion of PITTA in the stomach and bile salts from the liver, but it also helps its elimination, which helps to reduce PITTA aggravation too. Actually, it restores the natural functions of PITTA in the body. This principle applies it reduces the excess and increases the deficient. It increases strength, treats weakness and debility that occur either after fever or some chronic diseases. 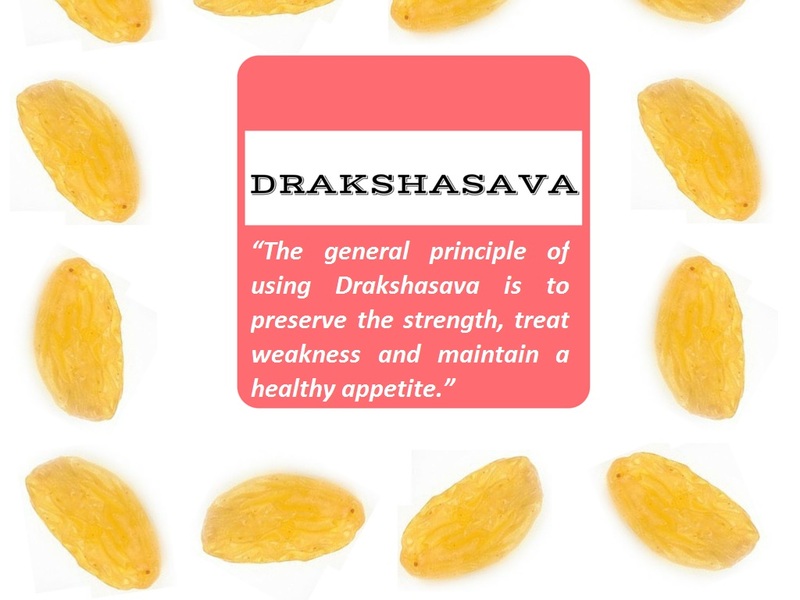 Drakshasava, main ingredient raisin, has mild laxative properties and stimulates bile from the liver, which goes to intestine and induces Peristalsis. This process naturally helps for improving liver functions, digestion and bowel movement. Bile insufficiency is not a disease, but it represents malfunctions of liver and gallbladder. It leads to poor appetite and indigestion. Bile tends to have alkaline nature and neutralizes the excess stomach acid before it enters the small intestine. In some patients, burning sensation occurs in the abdomen, which is due to bile insufficiency. In such case, Drakshasava increases bile secretion and restores its natural functions, which helps to improve digestion, liver functions and reduces indigestion and increases appetite. Belching (burping) is a normal reflex for expelling excess air from the stomach. In some cases, it becomes excessive and annoying. Drakshasava helps to reduce excess air in the alimentary canal and reduces excessive belching. The general dosage of Drakshasava is as follows. Drakshasava is considerably safe for most individuals when Drakshasava is taken under professional supervision and within the dosage of Drakshasava recommended in ayurveda. When Drakshasava prescribed after careful examination and ayurveda analysis, it does not have any side effects. When it is given in higher dosage, it can rarely cause loose stools in some people. Drakshasava might not directly influence your body weight. It actually corrects appetite and digestion, which might likely to increase weight in underweight and malnourished people. It also provides good nourishment and increases overall body strength. Weight gain can be possible with Drakshasava, but other herbs that directly work on weight gain are also required along with it. How long should I use Drakshasava? It depends on the problem for which you are using Drakshasava. In conditions like loss of appetite, debility, or fatigue, it should be sufficient for a month. In chronic diseases like chronic constipation, piles, anemia, abdominal diseases, chronic low grade fever, etc., it should be taken for a longer period or at least for 3 months. It can be used on long-term basis without any side effect.